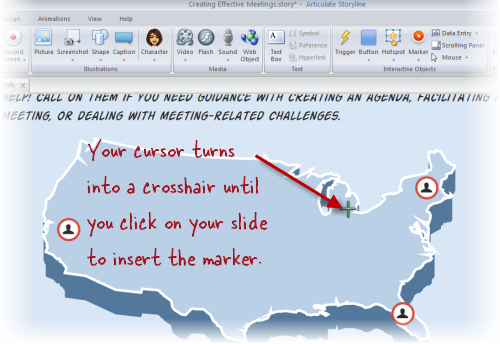 Markers in Storyline offer a quick and easy way to add a hover-and-reveal or click-and-reveal effect to your course. You can place a marker anywhere on a slide, and when learners view your published output, they can hover over it or click on it to experience additional content. That additional content can include a pop-up label, descriptive text, audio, an image or movie, or a combination of all of these. You can have as many markers on a single slide as you like. In Normal View, click the Insert tab and choose Marker. From the menu that appears, choose the icon you'd like to use on your marker. Your cursor changes to a crosshair shape. Click anywhere on your slide to insert the marker. Once you insert the marker, a label appears, where you can enter a title and descriptive text. By default, the title appears when learners hover over the marker, and the full label appears when they click it (but, if you want, you can customize this behavior, as we'll see in a moment). When you're finished, click anywhere outside the label to collapse it. Tip: If you prefer to omit the marker label and include audio only, you can just leave the label blank. See "Adding sound to a marker" and "Making an audio-only marker," later in this tutorial. Now that you've inserted a marker on your slide, there are all sorts of things you can do to customize the way it looks and behaves. Check out the options throughout the rest of this tutorial. Select the marker on the slide. The label appears automatically. Click and drag one of the resizing handles to change the label's size. Click and drag any part of the label's outline to move it to a different place, relative to the marker. Select the marker on the slide. On the Format tab, click Change Icon and pick a different symbol. On the Format tab, click Sound. Sound from File: This allows you to import an audio clip you've pre-recorded elsewhere. Learners will hear the audio when they mouse over or hover over the marker. Record Mic: This allows you to record and save the audio within the marker. Options: This is where you can change your audio playback device and recording devices. You can also modify the recording volume levels. These default to the same settings as your system settings. After you've added some audio to a marker, you'll be able to access additional tools, such as the Audio Editor, a volume adjuster, and more. To explore these options, select the marker, click the Format tab, and click Sound. For more details on using these options, see the tutorials on Editing Sound and Using the Sound Tools. On the Format tab, click Media. Picture from File: This allows you to insert an image that's currently stored on your computer. Video from File: This allows you to insert a movie that's currently stored on your computer. Video from Website: This allows you to insert a movie that's hosted on a website where embed codes are provided (such as Screenr, Vimeo, or YouTube). Record Webcam: This allows you to insert a video from your webcam. Once you've added an image or a movie to a marker, you can make adjustments or edits as needed. You'll just need to select the marker on your slide, then select the file or movie and choose the Format tab. For more guidance, check out the tutorials on Adjusting Properties for Pictures, Screenshots, and Characters; Editing Videos; and Adjusting Video Properties. On the Format tab, use the Animate selector to choose a different animation style, or choose None to remove the animation. By default, when you publish your course and learners hover over a marker, the label's title pops up. If learners click on the marker, then the entire label pops up, revealing any descriptive text, media, or sound you've added. If you want, you can change this behavior so that no clicking is necessary — when the user hovers over the marker, the entire label appears, and any sound associated with the label begins playing. To do this, just select the marker on your slide and, on the Format tab, choose Show All On Hover. Insert a marker as described above. When the label appears for you to enter a title and descriptive text, don't worry about entering anything. 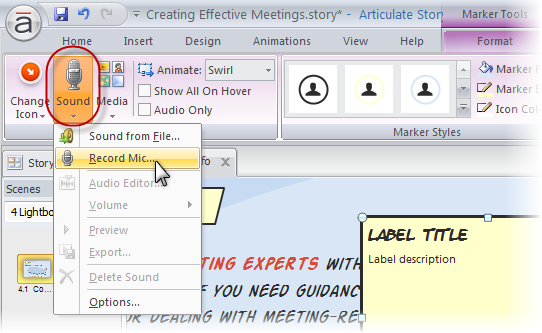 With the marker selected, click the Format tab, and use the Sound button to add some audio to the marker. With the marker still selected, click the Format tab, and mark the Audio Only box. On the Format tab, choose any of the ready-made Marker Styles. Or, use the Marker Fill, Marker Border, and Icon Color selectors to choose your own colors for these items. Note: The Marker Fill and Marker Border options behave a lot like the options for customizing the fill and outline of a shape—in fact, you can even change the marker fill to a picture, texture, or gradient if you want! On the Format tab, choose any of the ready-made label styles. Or, use the Label Fill and Label Border selectors to choose your own options for these items. The fill and border options behave a lot like the options for customizing the fill and outline of a shape. Tip: If you customize a label's fill and border, and you want to apply the same colors to labels of other markers on the same slide, just select the marker and, on the Format tab, click Apply To All. Customize a marker's fill, outline, and icon color and the corresponding label's fill and border color. Right-click the marker and choose Set as Default Marker.